This Wednesday there are no small groups because we are meeting at Foothills Community Church in El Cajon to join several hundred students from all over East County for a night of music, prayer, and a challenging message. Please drop your students off at Foothills no later than 6:55 pm and then pick them up at 8:30pm. It should be a great night and you as a parent are welcome to join us if you like. The series is about our core values or purposes. 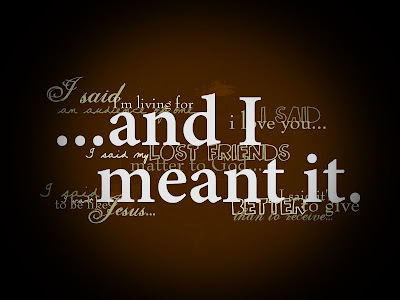 It's called, "... and I meant it." and we said, "It's going to be Awesome... and we meant it!!!" Here's the breakdown for the next 5 weekends. Week one: "I said I'm living for an audience of One... and I meant it." Week two: "I said I love you.... and I meant it." Week three: "I said my lost friends matter to God... and I meant it." Week four: "I said I want to be like Jesus... and I meant it." Week five: "I said it's better to give than receive... and I meant it." Join us for this series on SUNDAYS AT 8:30 AND 10:30 AM in Student Center A. Anyone know a family that comes to Journey from Jamul? We have a high school girl who wants to serve on our worship team but has trouble getting to church on the weekend. She's looking for a ride on Sundays and even Wednesday nights if that's possible so she can attend a small group. If you know someone who might already be headed to La Mesa from Jamul, perhaps we can create some carpool love. Shoot brian an e-mail to encounter@journeycom.org if you have some connections. To provide a worship service for high school students in East County that is practical, relevant, engaging, and fun while challenging them to fully devote their life to following Jesus. Currently we meet at 8:30 and 10:30am on Sundays. Most high school students and their peers are asleep during those hours. The 8:30 hour was not designed for a high school target. Our student leadership team must arrive at church at 6:45am to help us prepare and practice to put on a quality program for their peers. Visitors: the only way a visitor comes to journey in our high school program is if someone spends the night at a peer’s house and then comes in the morning with them or if their whole family is visiting. Those two scenarios make up almost 90% of our visitors. We would stop our 8:30am service, and as of October 28th, begin to offer a program at 10:30 am and at 6:30 pm instead. This would allow us to still provide a weekend service that is parallel to other Sunday programs and a service that is at an hour which is more conducive to high school cultural norms, thus allowing our students to invite their peers, much like the adults already do at journey. Our 6:30pm service would also offer a significant change in “atmosphere”. We will run our normal Sunday program for an hour and a half from 6:30 to 8:00pm. However, we will also offer some “hang out time” before and after by opening our doors and encouraging students to come as early as 6pm and stay as late as 9pm if they’d like to hang out in our café, play some games, or just meet some new friends. WHAT SHOULD AN 8:30 AM ATTENDING FAMILY DO? Well, there are a multitude of reasons someone chooses the 8:30 am service for their family. We don’t want to hurt them, we’re really trying to help students and their peers follow Jesus in this change. Here’s some possible solutions. Become a 2 service family. Come at 8:30 am and serve in children’s ministry or in the café or usher or wherever during the 8:30 hour and then send your high school student to us at 10:30am and you go to main and meet after. Sleep in and become a 10:30am family. Stay an 8:30am family, but allow your high school student to catch up on sleep so they can come to our 6:30pm service instead. Stay an 8:30am family, but allow your student to serve in children’s ministry etc. during the first hour so they can come to our 6:30pm service. Stay an 8:30am family and have your student join you in the main service and then they can come to our 6:30pm service. WHAT ABOUT HOMEWORK AND RIDES? We find that students will make time for what they value. Some students have a habit of doing homework on Sunday night. This is something they would have to change if they were to make Sunday night a viable solution for them. Perhaps it means doing it Sunday afternoon instead. As for rides, students seem to manage to carpool their way to all kinds of activities. Our hope is that students will do the same for Sunday night- much like they might for a movie or something. We seriously considered this option (it would be better for our high school pastor Brian too) and even did an experiment with it last year with our student leaders. We had meetings set up for every 2 weeks before the Friday service where we had dinner together and then we would attend the Friday service together. After trying to make it work for 3 months, we had to give up. This is not a good time for a program at church, simply because of so many other options available to students in our area during that same time. Saturday has the same problem. Currently the college ministry meets in the high school room on Sunday nights too. Starting on October 28, college will be utilizing another room on campus. No change is easy and no change is perfect for everyone. Our hope and desire is to help students grow in their faith while giving them a realistic chance to invite a friend too. We hope we lose no students and that this transition is one where as a team (both high school ministries and the families represented with in it) we will make the necessary sacrifices and changes to see this transition be a success over the long haul. Questions or concerns: Please don’t hesitate to ask our high school pastor, Brian Berry- by phone at 619.464.4544 ext. 237, by e-mail at brian@journeycom.org, or by appointment. Small Groups Start tomorrow night in Student Center A from 7 to 8:30pm. The cafe will be open for drinks and nachos and stuff if you want to send a few bucks along for grub. We will meet as a large group- all the girls and the guys together and spend some time finding out who will be in what small group, setting some small group expectations, and playing some get-to-know-you type games. 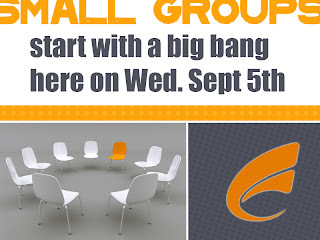 If your son or daughter wants to be in a small group, this wed. is the night to start. Then on Sept. 12 and 19 we'll have small groups in homes for the girls and in Student Center A for the guys. Directions will be sent home on Wed night and available from our church office as of Thursday this week.